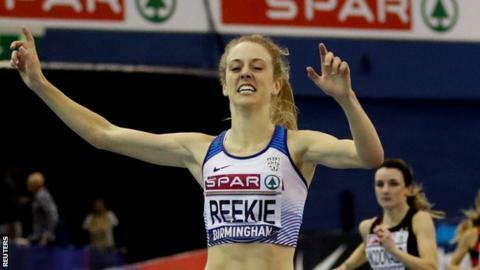 Jemma Reekie took inspiration from training partner Laura Muir to win the 1500m at the British Indoors and take her place on the Great Britain team for next month’s European Indoors in Glasgow. The 20-year-old European junior champion is part of Andy Young’s training group alongside Muir, who won the 3,000m title on Saturday. She added: “I really wanted to be in Glasgow. Laura is the best in the world and every day I am challenging her. Reekie could be lining up against Muir in Glasgow after her rival indicated she would be looking to defend both her 1500m and 3,000m European Indoor titles at the event from 1-3 March. Katarina Johnson-Thompson was victorious in the long jump with a leap of 6.46m, 10cm ahead of Jahisha Thomas and enough to qualify her for the event in Glasgow, but the multi-eventer said afterwards she would only compete in the pentathlon. However, the world indoor pentathlon champion expressed her regret at the fact she will not face Belgium’s Olympic, world and European heptathlon champion Nafissatou Thiam, who will miss out with a calf injury. “It’s a real shame. I was a bit gutted because she wasn’t in Birmingham last year and I like to compete against her,” said Johnson-Thompson. “I haven’t done a pentathlon this year and there are a lot of good girls out there and anything can happen on the day. Commonwealth Games high jump silver medallist Morgan Lake won her fourth British indoor title with a best jump of 1.94m but the 21-year-old missed out on the British record after three failures at 1.99m. Sophie McKinna put in the best display of British women’s shot putting since 2000 on her way to winning gold. She set a personal best with her opening throw of 17.64m and improved that twice more to finish with a best of 17.97m. It puts the Great Yarmouth athlete in the top 10 in Europe this year and is only 3cm away from the qualifying mark for the World Championships which start in Doha in late September. Other winners, who will be now be part of the team for Glasgow included Shelayna Oskan-Clarke (800m), Zoey Clark (400m), Chris O’Hare (3,000m) and Feron Sayers (long jump). There was a season’s best for Tom Bosworth who won the 5,000m race walk in 19 minutes 22.56 seconds.